I woke up thinking about Michael Flatley and the Riverdance musical. Why? I don't know, but there's no accounting for dreams, I suppose. 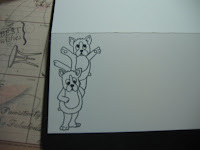 Anyway, it got me to thinking about my Dancing Dogs stamp set by JessicaLynn Original stamps and wondering if I could make a chorus line with them. The short answer is YES, I can! That train of thought turned into the making of a photo tutorial which I shall endeavour to do here. This is my first time doing a photo tutorial, so please, bear with me. The technique I used on my card is masking and this is what I know about masking: you need to stamp the image you want in the forefront first, mask it, and then stamp your secondary image so that it will appear as if it is behind the main image. Clear enough? No, well here are the step-by-step pictures. 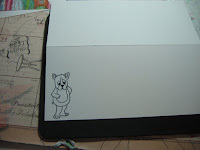 Stamp your first image onto your cardstock. Then stamp it again onto a post-it-note and cut it out. Place the post-it-note stamped image over top of the main image on your cardstock. Now stamp the image you want to have in the background. Don't worry about your post-it-note image getting messy, it's supposed to be that way. See how the top image appears to be behind the first stamped image. Perfect! 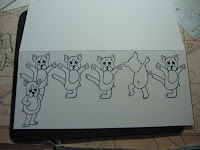 From this point, I just carried on stamping my chorus line of dancing dogs. See the fourth dog from the left. He's dancing to the tune of a different drummer! This step is optional because I wanted to make the dog in the bottom left, whom I shall now call the "emmcee", to really stand out. 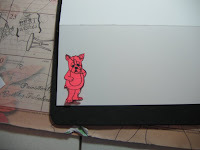 I stamped him twice more onto plain cardstock, coloured him up and cut him out. Can you see how he stands out as you layer one image on top of the other? I did it twice for a really good "pop". And now for the finished card. I coloured all the images with Copic markers. Because this is a busy card with all the Dancing Dogs, I didn't want to use too much patterned paper, but it needed some colour in the white space. The Dancing Dog set comes with the Treble Clef and the Note on one stamp. I used three different ink colours: Pink Pirouette, Certainly Celery and So Saffron. The sentiment is computer-generated and layered over some Two Scoops DP by Basic Grey. The addition of the little "Pearls" were meant to look like lights on a marquee. 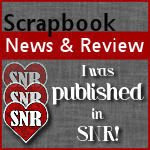 The dimensions of the finished card is 3-3/4" x 8-1/2" and it will fit perfectly into a No. 10 size envelope. 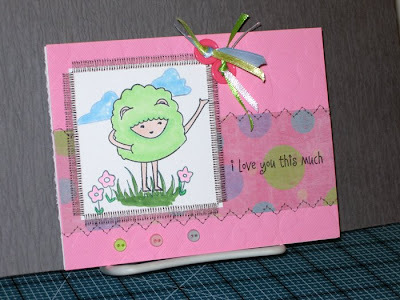 I love, love, love Hooga Booga stamps by MFT! I first saw this set, designed by Stephanie Fizer for MFT, a couple of weeks ago while blog surfing. I had to have it. Finally, the postman left it in my mail box and this morning is the first time I've felt up to stamping. I've had this nasty, persistent cough for the past couple of weeks and it's not going away. I've had to use my puffers regularly over the last few days, so I think I'll go to the doctor's office today! Thank goodness for walk-in clinic hours. Anyway, enough about me, on to the card. Is this not THE most adorable image you've seen in a while? Well it is for me. There are two other sweet images, along with several sentiments in this set, and I'll be putting them to good use over the next bunch of weeks. I'm going to use these for my Easter cards for the grandkids! You can't really tell, but the larger pink mat is actually an embossed cardstock which I picked up at Stamping Bella and this is the first time I've used it. It's unfortunate the photo doesn't pick up the embossing, but believe me when I say it looks super in real life. 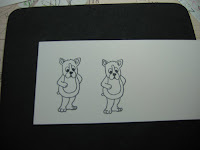 The image was coloured with Copics and I used a satin stitch to adhere it to the card. The patterned paper is from my scraps drawer. The addition of the buttons with the ribbon and the three smaller buttons along the bottom finish it off nicely, I think. 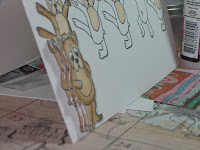 Stay tuned for more cards made with Hooga Booga stamps, I'm not done with them yet! 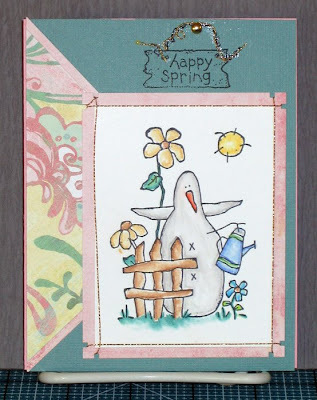 With Spring just around the corner, I thought it quite appropriate to use some of the "springy" stamps that were in the grab bag of a year, or so, ago. I took a good look and found this image. It looks like a snowman, but not really, but he's surrounded by flowers, watering can and a brillian sun. If you have a clue what this is, please let me know. Also, the sentiment is a partially inked stamp so that I just got the "Happy Spring" part of the stamp. I'll make another card soon that uses the entire stamp so you can see it. Okay, that's it for now, just a short post. I'm off to get a good night's sleep. I'll be back soon. This image was from a grab bag I received quite some time ago. I wasn't quite sure how to use it to its best advantage until one day, after inking it up, I doodled a frame around it. It made all the difference, at least in my opinion, and I now thought it worthy of a card all its own. I started off with a base of Groovy Guava. The greenish layer is Bazzill and it's a brand new colour which I picked up at Stamping Bella. I was actually in the store when they opened the box, so I'm sure I was one of the first to buy this colour. Sorry, I don't remember the name of the colour. My bad! 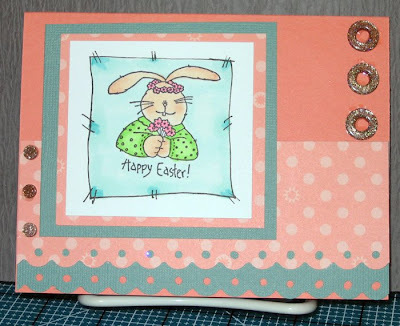 The embellishments on this card are also from Stamping Bella. The glitter donuts, the glitter dots and even the Threading Water punch by Fiskars was purchased at Stamping Bella. The DP is from last year and it's from SU. Well, there you have it, my Easter Card. Hope you enjoy it. That's what my grandson who is 2-1/2 years old says to me all the time. He doesn't cry like this little guy, but he loves to be picked up. 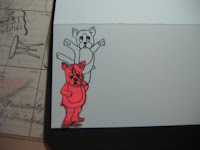 This is from one of the new sets available at JessicaLynn Original Stamps. You really get a lot for your money in this set. 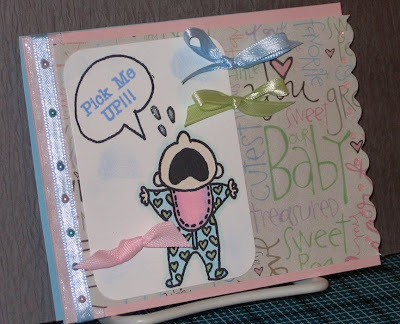 I started with a light blue base of inexpensive cardstock from Staples and added some Pink Pirouette by SU. Onto that, I added some sheer blue ribbon and a strip of light blue ribbon down the middle of the wider sheer ribbon. I placed some really cute pearls in the colours I used for colouring the image and they are also found in the DP by Heidi Grace Designs. The DP has a lovely glittery effect. I used the Threading Water punch by Fiskars and added ribbon bows, too. The teardrops are coloured with a light grey and dusted with Glamour Dust. I hope you like it and go to JessicaLynn Originals to take a peek at all the wonderful stamps on offer. My friend, Sue, a.k.a. 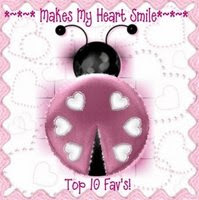 frankiesue, sent me this lovely award while I was in cyber-limbo. I am very pleased to post it today. Apparently, there is one rule to this reward, and that is to pass it along to 10 people. Well, I visit about 70 blogs, through Google Reader so I get an overview of each blog, so it shouldn't be hard to find 10 blogs I love. Some of these people won't even know who I am, but they should now that I admire their work, so here it goes: Gina K., Julee (vervegirl), Color Throwdown, Dana, Little Paper Shop, Carole, Jenn, Traci, Shannon and Cathy. These names are in no particular order, I enjoy them all. You are all worthy of this award and a huge thank you to Sue for bestowing it upon me. I hope we get to meet up when I'm in London visiting my DD. Finally, we have internet again! It's been a long time, but we're back now and very happy. To celebrate our return to cyber world, here's a little video of our kitten, Burt. I just picked up this toy for him the other day and he loves it. In fact, we think he may be addicted. He starts to play with it, sending the ball swirling around and around, tries to catch it, it spins to other way and, after a few minutes, Burt walks away. However, he can't stay away and runs back to attack the toy again and again. It's great because the little ball never finds its way under the couch or fridge or some other awkward place from whence it can't be retrieved. Anyway, I'm back and hope you enjoy the clip.